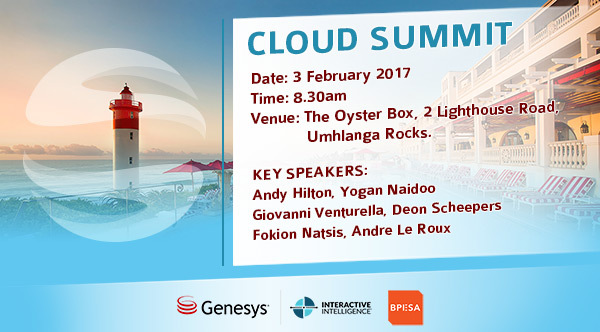 With Top Sponsors and Partners, we have secured the best venue in February to host a Cloud Summit at Oyster Box, Durban. Enabling you to Scale your Services and Reduce Costs. Improve Customer Experience and Increase Productivity. Speakers from BPESA, Genesys | Interactive Intelligence and SafriCloud. Streaming live on YouTube and LinkedIn.